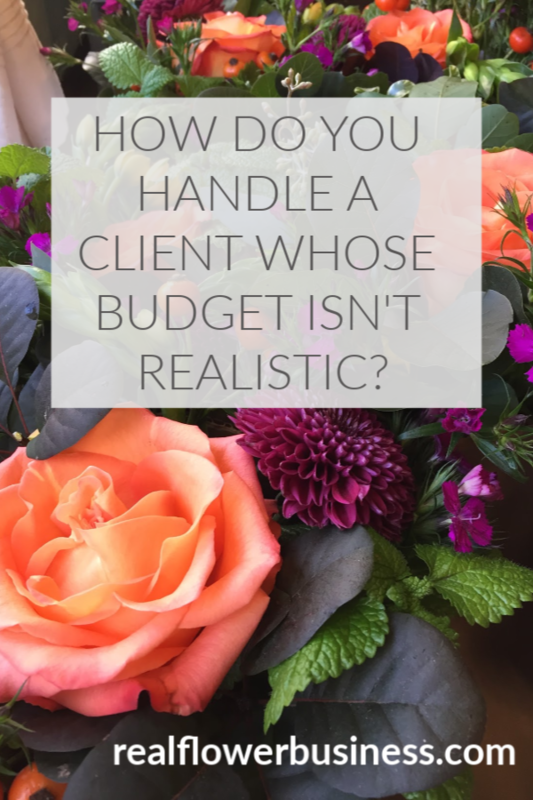 What if a client’s budget isn’t realistic? If you’ve been in the floral business for more than a hot-minute you’ve probably experienced a client whose budget simply doesn’t align with their wishes. Wedding pros tend to blame Pinterest for this “unrealistic budget epidemic”, but the truth of the matter is that all businesses experience this issue. Many skilled & experienced business owners manage to convert an “unrealistic budget client” into an “I’ll pay anything customer”….because there’s a way of selling and serving a client at the same time that establishes a level of trust. Our clients rely on us to prequalify and educate whenever possible. Unrealistic expectations around their floral budget does not mean the customer is “uneducated”. An “uneducated customer” is an opportunity. When a client understands the value of the service, they start to realize how much they actually want it. Some florists may not be able to “get more money” from a client’s budget, however by expressing their willingness to do what they can to “make it work”, the client feels the value of service and expertise and proceeds with the knowledge that while her dream doesn’t fit their budget, they’re still getting the most “bang for their buck”. There’s no right answer here…just for the record. You also don’t HAVE TO say “nope, this budget won’t work” if you want to make it work (as long as you can still turn a profit). We can’t do everything and anything a client requests. We should choose to create rules that align with our business goals. To paraphrase The Rolling Stones, “Time is on my side….yes it is!” …so the longer I’ve been in business, the easier it’s become to navigate these budget conversations. If you’re not making a deliberate effort to streamline and improve communication, so your clients understand exactly “how this is gonna work”, you’re not doing enough to ensure your longterm success. Standards and boundaries clear the path to reaching your ideal clients. Setting boundaries takes practice. And confidence. And more practice. Thanks for taking some time out of your day to stop by my site. Keep doing beautiful work, floralpreneur®! P. S. Have you joined my Facebook group yet? Click HERE to join & I’ll see you in the group! Check out my first podcast interview on the From The Ground Up Floral podcast. Click HERE. Flower Math: The Florist’s Guide To Pricing And Profitability. Click to learn more about the course. Is it time to lose your auto-reply? As commander-in-chief of my one-woman floral army, balancing time between my design bench and my office means my commitment to prompt e-mail replies can be a challenge. One way businesses attempt to provide a prompt e-mail response is, of course, the auto-reply. and then, it turns into a regular habit…24/7 auto-reply. so while it’s prompt, it also feels impersonal. The bottom line is this: An auto-reply is not customer service. There’s a time and a place for auto-reply, but if you pride yourself on customer service, then, limit your reliance on auto-respond. And if you are going to use it make sure you remove your auto-reply once you are “back in the office”. E-mail is a crucial part of your customer service experience. I streamline my processes while establishing authority and trust in my e-mail communication. I created my E-mail Templates for Florists to help florists navigate some of our most frequent (& sometimes difficult!) customer conversations. Try ’em. You’ll like ’em. Florists who use my templates…. Increase INCOME by stating minimums clearly so clients say YES to your next proposal, no questions asked! You can spend HOURS trying to figure out how to say something “just right” or you can do something that will change your life…which is what florists tell me all the time about my templates! Testimonials are powerful tools in your business. Great testimonials help do the work of establishing trust and building brand authority. But before you can put your testimonials to work for you, you must gather rave reviews. What’s the best way to get more reviews from clients? Whether you send a survey from your company, or ask clients to review your work online on a service like Wedding Wire or The Knot, it’s worth taking the time to request the feedback you seek! Push yourself out of your comfort zone! If you’re not in the habit of asking for feedback, make it a part of your workflow process asap! If your clients had a good experience with your company, you want to know about it! And if for any reason they had a “less than awesome” experience, well, you should want to know about that, too…. Because your client’s feedback reflects the truth about what you’re actually delivering…. And if you’re especially good at what you do, there’s no better way to say it, than in your own customers’ words. Want some more insight on how I build trust and authority? Check out my E-mail Templates for Florists here! P.S. Read some of my course testimonials HERE.